Red Dwarf is back!! I’d been hearing rumblings for a couple of months that ‘something’ was possibly going to happen, but I always take these things with a pinch of salt, as they often never amount to anything. However, this is confirmed. Digital channel ‘Dave’ is going back to the Dwarf for a two-part Easter weekend special which see Rimmer, Lister, Cat, Kryten, and Holly finally make it back to Earth… but what will they find there?.. Seeing as the BBC totally ignored the 20th aniversary (20yrs… man, i’m old!) of Red Dwarf last year, i’m really happy Dave has picked up the show, even if it is only for a one off special! 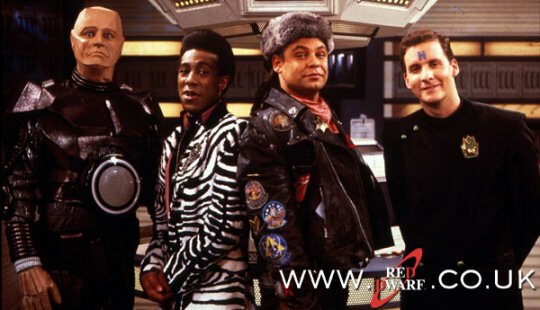 Red Dwarf: Back to Earth will be written and directed by Red Dwarf co-creator Doug Naylor. ← The Portal Gun from Portal IRL! Oh my god, they are going to ruin it. I just know they are..! Its actually a 3 parter though. The third part is going to be an ‘unplugged’ style ad-lib session with the cast.